My Mouth’s Watering Just Thinking About Your Balls! 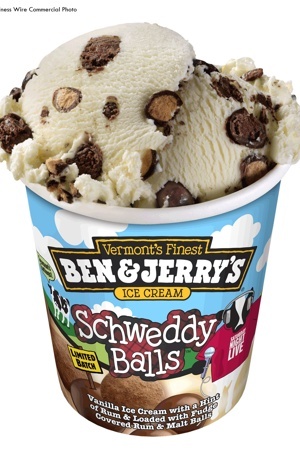 Perhaps they were some legal logistics involved, but nearly 13 years after the infamous “Schweddy Balls” skit starring actor Alec Baldwin and SNL alums Molly Shannon and Ana Gasteyer, Ben & Jerry’s has just announced the reveal of a new “Schweddy Balls” flavored Ice Cream. Pete Schweddy: Well, there are lots of great treats this time of year – zucchini bread, fruitcake…but the thing I most like to bring out this time of year is my balls. Rumors swirled about a Ben & Jerry’s take on “Schweddy Balls” as I do believe I speculated about this on my Facebook page after hearing the buzz months ago. “Please God let this be true!” is what I wrote on June 14th in response to finding this article on The Scoop. According to the label the new flavor is made up of Vanilla Ice Cream, a Hint of Rum & Loaded with Fudge Covered Rum Balls & Malt Balls. In response Baldwin said: “For a long time, I thought that ‘Here Lies Pete Schweddy’ would end up on my tombstone, Now, thanks to Ben & Jerry’s, the goodness of the Schweddy family recipe won’t go with me to the great beyond.” While I sense his sarcasm, it is certainly a dessert that I can’t wait to get my mouth on and I say; Embrace it Alec, because truly: no one can resist your Schweddy Balls. Posted in Uncategorized.Tagged alec baldwin, ana gasteyer, ben & jerry's, betty white, ice cream, molly shannon, new flavor ben & jerry's, npr, schweddy balls, schweddy balls ben & jerry's, schweddy balls ice cream, snl. I can’t wait to find this, hopefully it’ll be in a store near me. I know. I’m going to stalk every store I go to. Like, I really can’t wait to have these balls in my mouth – no joke.